What an inspirational poems this is! Yes, 'do not weep' is a beautiful poem about love and loss. It is ideal for those suffering a bereavement, but non-grievers can also gain spiritual nourishment by embracing the meaning of these gentle words. Thank you Mary Elizabeth Frye. May you Rest In Peace. 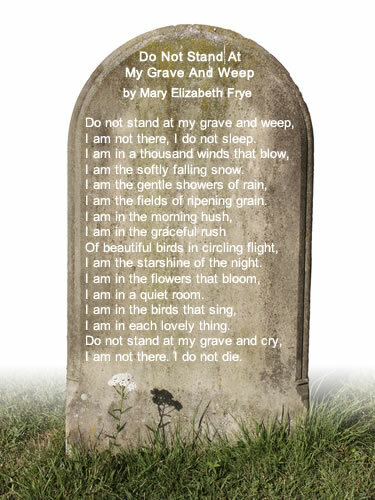 Share this 'Do not weep' poem page - thanks!